Midwest Rivers Crest As Towns Wait To See Some Relief : The Two-Way The Mississippi River continues to rise, overtopping small levees north of St. Louis. But some of the bigger problems are in Illinois, near the town of Peoria. 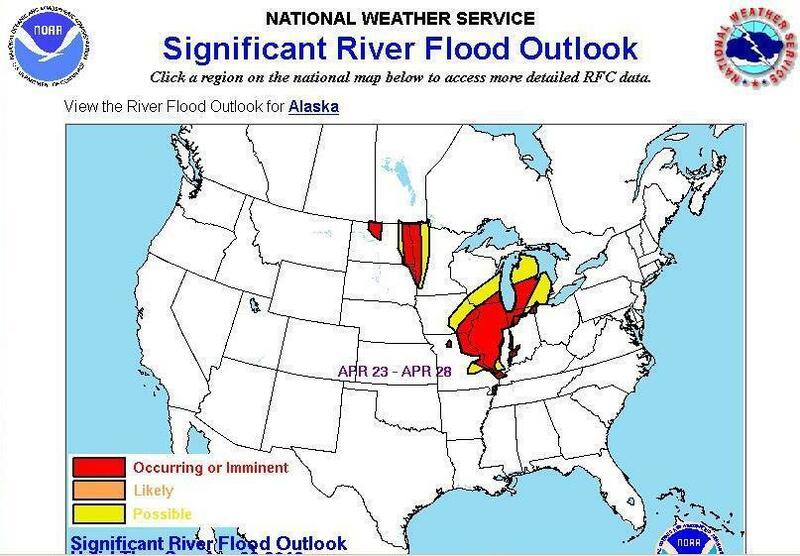 National Weather Service Significant Flood Outlook for the week of April 23 - 28, 2013. Flooding continues to plague the upper Midwest, as waters crested at record highs in places and weary river-town residents watched the flood markers for signs of relief. NPR's David Schaper, reporting from Chicago, tells our Newscast Unit that the Mississippi River continues to rise, overtopping small levees north of St. Louis. But he says some of the bigger problems are in Illinois, near the town of Peoria, where "many roads, homes and businesses are flooded, and dozens of Peoria-area residents have been evacuated." The Illinois River crested Tuesday in Peoria about two inches below its record and volunteers worked steadily to throw up sandbag barriers to stop flooding from inundating the city, reports the Journal Star. Heavy rain also triggered a mudslide, forcing some residents out of their homes. The U.S. Geological Survey says it "has measured the highest levels of flooding ever recorded" in Illinois. It adds that "more record levels are expected as flooding moves downstream." But there's some hopeful news for Peoria residents: The Associated Press says floodwaters have begun "a slow, inch-by-inch retreat" and that "authorities watching the receding waters expressed relief that, so far, no lives have been lost." "Elsewhere, there were no reports of other significant Midwestern population centers in peril, but officials were urging caution because of predictions that waterways will remain high through early May and sustain pressure on earthen levees." Accuweather was predicting continued flooding along the Illinois, Mississippi, Red and Wabash rivers, as new rain and snow falls on saturated ground. But the outlet's weather forecasters think the new storm systems will slide across the region so fast they won't be able to dump as much precipitation as last week's storms. So much rain has fallen on the region in the past several days that barges broke free from moorings on the swollen Illinois and Mississippi rivers. WMAQ-TV of Chicago reports some loose barges on the Illinois River damaged a dam near the town of Marseilles that is "considered critical to Illinois River operations." And Reuters says 114 barges escaped on the Mississippi and 11 of them sank. River traffic on the Mississippi was briefly halted, but has since resumed, after the barges were corralled. "In Grafton, where the Mississippi and Illinois rivers meet, the rivers already have flooded some homes and businesses, including the Loading Dock and Hog Pit restaurants.
" 'Every inch makes it worse, but people understood what was coming,' said Grafton Police Chief Chris Sullivan." Four flooding-related deaths have been reported. CNN says a body was discovered in Indiana on Sunday. Last week, there were fatalities in Indiana, Illinois and Missouri.